SNOW & ICE MELTING SYSTEMS – Senergy Mechanical Inc.
Winter comes with many annual hassles, snow and ice being the worst of them. 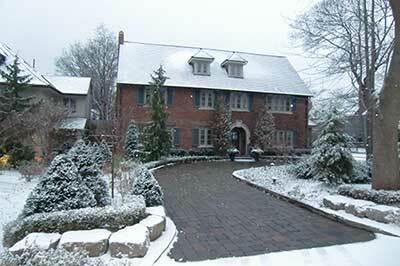 Icy roads lead to dangerous driving conditions and snow prevents easy access to driveways and walkways. Traditional snow and ice removal techniques such as using salt, ice melt chemicals and sand are messy and require constant purchases. Downsides of these methods include the damage they cause to entrance areas when the salt, water and chemicals are brought inside by shoes. Other methods such as shovelling are physically demanding and time consuming. For members of the community unable to do these things, snow and ice removal becomes a challenge. 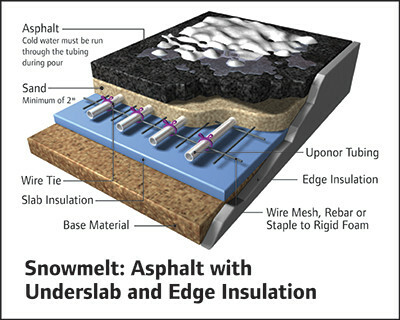 For your benefit we offer driveway snow and ice melting system by Uponor to make your winter season worry free and leave you prepared for the weather. The system works by circulating warm water through cross-linked polyethylene (PEX) tubing buried underneath the asphalt, concrete or any other surface. The PEX tubing has characteristic features that make it the best material, ideal for use for plumbing and hydronic heating. The water that runs through the pipes is mixed with anti-freeze to prevent it from freezing and bursting the pipes for efficiency and permanence. The heat from the water warms the surface, in the process melting the snow and ice. Apart from driveways and sidewalks this is the ideal solution to hard-to-plow areas such as stairs/steps, decks, docks and ramps. This method requires a single installation of the hydronic system which will automatically melt snow and ice each time without taking your time and effort. The snow melting system leaves no residue or mess and works by melting the snow just like it would melt naturally during spring. This method can also help reduce damage caused to pavements by freeze/thaw cycles by melting the ice immediately before damage can occur. For these reasons we highly recommend the installation of a snow-melt system. With our highly qualified professionals doing the work you can rest assured that the end result will be executed with efficiency and skill. At Senergy Mechanical Inc. we use only the best materials from Uponor for quality results that last. We pride ourselves as a company with excellent workmanship that produces high customer satisfaction rates. For your next installation of snow and ice melt system you can reach us at (647)298-9247 for more information or to schedule an appointment.